Wright Morris was born on January 6, 1910 in Central City, Nebraska. His mother, Grace Osborn Morris, died within days of his birth, leaving Morris “half an orphan.” His father, Will Morris, was a traveler and “wanderer” who often left Wright in the care of neighbors. During his childhood, he and his father lived in several Nebraska towns before finally settling in Omaha from 1919 to 1924. While he lived in Omaha, Morris spent two summers on his Uncle Harry and Aunt Clara‘s farm near Norfolk, Nebraska. Two decades later, he would return to this farm to take some of his most memorable photographic images. In 1924 father and son moved to Chicago. While living there, they went on a road trip to California, which would later become the basis for his first novel, My Uncle Dudley. Morris moved to California, briefly attending Pacific Union College located in the hills above Napa Valley. He then lived in Texas for a short while to work with his Uncle Dwight, returning to California to attend Pomona College in Claremont until 1933. After college Morris spent a year abroad in France, Germany, Austria, and Italy. In 1934, Morris returned to the United States, married Mary Finfrock and began to develop his interest in photography. Several years later, Mary Ellen accepted a teaching position in Connecticut. Shortly after their move, Morris decided to go on a “photo-safari,” traveling through the South, Midwest, and West and spending the winter writing in California. In 1942 and 1947, Morris was awarded two Guggenheim Fellowships for photography. The money from these Fellowships helped to fund his trips back to Nebraska and to the inspiration for his first two photo-texts, The Inhabitants and The Home Place. In all he produced three books of photographs with complimentary prose: The Inhabitants, published in 1942; The Home Place, published in 1948; and God‘s Country and My People, published in 1968. 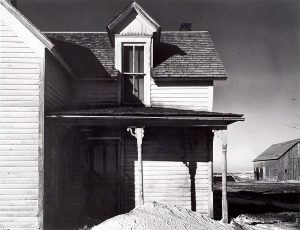 The Home Place is filled with photographs he took during April and May of 1947 at his Uncle Harry‘s farm near Norfolk, Nebraska; the photo-text combination evokes life on a plains “dirt farm.” These photographs that document the fabric of rural American life are widely considered to be among Morris‘ most important work. From 1944 to 1954, Morris lived in Pennsylvania, after which he spent a lot of time in California as well as Mexico, Venice, and Greece. He traveled to escape his failing marriage. In 1959 he went to Venice with Josephine Kantor, whom he married the following year. Two years later in 1963, Morris began to teach creative writing at San Francisco State College where he remained until 1975. During this time, Morris wrote many of his major works, and continued to write after he retired from teaching. He had the honor to be awarded the American Book Award in 1956 and 1981, and the Guggenheim Fellowship in Photography in 1941, 1947, and 1954. Some of his other awards include the Mari Sandoz Award, Robert Kirsch Award, Mark Twain Award, Life Achievement Award from the National Endowment for the Arts, Whiting Award, and Commonwealth Award for Distinguished Service in Literature. Morris lived with Josephine in Mill Valley, California until his death in 1998. The Museum of Nebraska Art holds 130 photographs by Wright Morris — believed to be the largest number in a public institution.